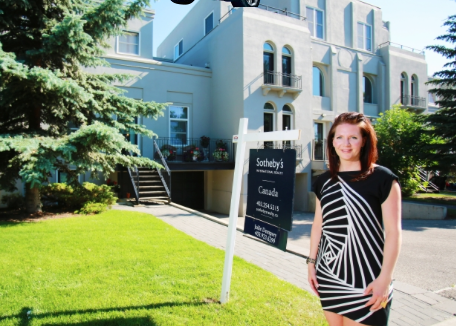 Realtor Julie Dempsey, of Sotheby’s International Realty Canada, says the continued growth in Calgary’s population continues to fuel the local real estate market. CALGARY - Calgary’s resale housing market is on pace to set a record for total dollar volume in MLS sales in a year, eclipsing the $11.3 billion peak established during the housing boom of 2007. Year-to-date until the end of August, there have been 18,521 transactions at an average sale price of $482,185 for a total dollar volume of $8.9 billion, according to the Calgary Real Estate Board. Last year, during the same period, there were 16,712 sales with an average price of $456,629 and a total dollar volume of $7.6 billion. During the record year of 2007, there were 26,611 total sales all year with an average sale price of $423,770. Last year was the second highest dollar volume on record at $10.7 billion with 23,474 sales and an average sale price of $456,595. Julie Dempsey, a realtor with Sotheby’s International Realty Canada, said the number of new people moving to Calgary is the main factor behind such strong sales activity in the city and the continued elevation of prices. “The listings that I am currently working on have a common theme: they are owned by savvy investors who see the strength in Calgary’s market and they are choosing to cash in,” said Dempsey. Average sale prices in Calgary have jumped by more than $225,000 since 2005. Calgary’s latest housing boom is being fuelled by net migration. According to Canada Mortgage and Housing Corp., net migration to the Calgary census metropolitan area was 45,168 in 2013 and 31,996 in 2012. During the housing boom of 2006-2007, net migration peaked at 25,120 in 2006. “The higher dollar volume is a reflection of the composition of sales,” said Ann-Marie Lurie, CREB’s chief economist. “When we look at what at this year compared to 2007, of all residential sales activity a greater share of the sales have been occurring in the $500,000 plus price ranges. Meanwhile, the share of sales has dropped for the under $400,000 sales.